Stuart Marshall at the N Peal building in Hawick. The decision to home Hawick’s new £610,000 textile training centre within the town’s high school has been slammed as a missed opportunity by town councillors. The creation of a centre of excellence in textiles in the town was announced last year, but exactly where it would be sited was only confirmed last Thursday. Clair Ramage at Hawick High School. It was first thought the centre, intended to help boost Hawick’s economic fortunes by supporting its textile and knitwear firms, would be housed within one of the town’s redundant mill factories. It will, rather, be based in a prefabricated building at the Buccleuch Road school early this year, however. And that’s a move being blasted as “short-sighted” and “unambitious” by some town councillors. Hawick and Denholm councillor Stuart Marshall accused the council of taking the easy option by ruling out a refurbishment of one of the town’s many vacant sites. “I feel that we in Hawick have missed a golden opportunity to restore one of the many derelict factories and buildings that we have dotted all over the town,” he said. “I think many people in the town were shocked when they heard it was going to be in a prefab round the back of the high school. “We have been short-changed again. He gave examples of buildings he thought suitable as potential homes for the centre including N Peal’s cashmere factory in Victoria Road, the former Woodcock’s factory in Mansfield Square, the old cottage hospital in Buccleuch Road and the former Langlands and Laing’s mills at Underdamside and Slitrig Crescent respectively. “All are lying in ruins, and with a bit more ambition, I think we could have attached this centre to one of those,” Mr Marshall said. “Of course, the money must be welcomed, but wouldn’t it have been better to renovate an old historic factory which could also have been home to a working museum for knitwear and textiles? Hawick and Hermitage councillor and town provost Watson McAteer is also “extremely disappointed” by the decision. “We do not want to seem too negative because we do welcome the money. That’s very positive,” he said. “But I had a conversation with the previous director of education about what a new Hawick High School would look like and this was never mentioned. He added that he will be writing to the council’s chief executive, Tracey logan, to find out why Hawick councillors were not consulted about the decision. Hawick and Denholm councillor Clair Ramage, a former teacher at the school, was initially positive about the announcement but has since slammed the council over its apparent lack of consultation and its “short-sighted” decision. “This is how the council operate,” she said. “They do not include elected members from the town to discuss the best way forward and give no time to discuss what is a very important decision for our area. “We have many vacant buildings that could have been adapted to become our new textile centre. “It could have become a tourist attraction, but no, it has been decided to use a prefabricated building at the back of Hawick High School that is recognised to be in a poor state of repair and prone to flooding, not just from overspill from the river but coming up through the ground. “Money will be wasted papering over cracks and trying to make a silk purse from a sow’s ear. “Where is our ambition and why have we to accept not only second best but a very poor final outcome? “Only in November we had the report back on the schools estate review stating that Hawick High School was in a poor state, but it is deemed suitable for this new facility – really? “Many of our pupils are better suited to practical skills, but I have been told that by developing this area for a centre of excellence they are losing a woodwork room, and I understand that more rooms will be lost. The town’s community council also discussed the news at its meeting on Monday night. Vice-chairman Cameron Knox said: It’s good that it’s got the money, but it’s not the best place to house it when there’s so many buildings in the town that could be brought back into use to house it. “A cafe and a small museum could back onto it then. “I think it’s in the wrong place. I think it should be in an empty building. There’s plenty of them going about in Hawick. Not all of Hawick’s councillors are disappointed by the council’s choice of site, however. Hawick and Denholm councillor Neil Richards said: “Making use of available space is an inspirational move. “The centre will place textiles and knitwear as a go-to career for the next generation of skilled workers. 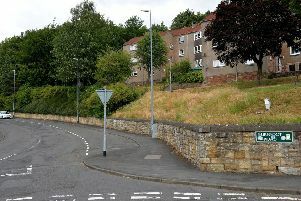 He added: “I was pretty surprised at the recent Hawick Community Council meeting at the lack of support for the plan. “Given the demand for skilled workers you would thought that the sooner a skill centre was up and running the better. “Demands that a redundant old mill should be renovated are great, but a modern mill environment is more in keeping with today’s industry. Hawick and Hermitage councillor Davie Paterson said: “It’s only going back to where it once was at the high school. “I know that local textile manufacturers have been crying out for more qualified workers who are better able to cope with the new methods of working in the industry. Fellow Hawick and Hermitage councillor George Turnbull added: “This is fantastic news for Hawick, and this should go a long way to upskill individuals to gain employment within the high-quality knitwear industry. “There are so many job opportunities within the textile industry, and we all need to support our knitwear manufacturers, who produce world-class products and very high-quality knitwear products. The centre is being set up by a partnership made up of Scottish Borders Council, Skills Development Scotland, Scottish Enterprise, Scottish Development International, the UK Government Department for Work and Pensions and textile and knitwear manufacturing businesses. Training will be provided for the town’s current textiles and knitwear workforce and also their future colleagues aged 16 to 19 via foundation and modern apprenticeships. The centre will be managed by Alistair Young, formerly operations manager at Peter Scott’s factory in Buccleuch Street, closed in 2016. Scottish Borders Council’s executive member for business and economic development, Mid Berwickshire councillor Mark Rowley, said: “Creating the new centre in the town’s high school is an important step in making closer links between the education of the young people of Hawick and the surrounding area and a thriving business sector which is in need of skilled employees. “It is absolutely clear that the growth of the industry in the town, and potential inward investment, is reliant on skilled individuals being available. “The creation of the centre in the school is a unique opportunity, and there are a number of future opportunities that can be exploited by establishing close links between the two.